Acacia is a genus of around 1000 species, most of which occur in Australia with another dozen or so being found in Asia. Until recently the genus was more broadly described with about 1400 species spread over five sub-genera. This is discussed further below (see "Acacia, Vachellia and Racosperma"). Acacias occur in all Australian states from coastal zones to mountains to the dry inland. Collectively, acacias are known as "wattles" and one of them, Acacia pycnantha, is the national floral emblem. The green and gold colours of the foliage and flowers has provided Australia's official colours. The derivation of the term "wattle" is interesting. "Wattle" is an old English word meaning interlaced rods and twigs. In the early years of the European settlement in Australia, shelters were constructed of flexible sticks woven together and plastered with mud, a technique known as "wattle and daub" and the wood most commonly used came from a plant now called Callicoma serratifolia which became known as "Black wattle". Callicoma has Acacia-like flowers but is not closely related to Acacia. However, because of the similarity in flowers, the term "wattle" eventually became associated with all Australian acacias and, even more confusingly, "Black wattle" is also applied to some Acacia species. Nodules on the roots of a leguminous plant. Together with the 'pea-flowered' plants and another group which includes Senna and Cassia, acacias are legumes and are able to take-up ("fix") their nutrient requirements for nitrogen directly from the atmosphere with the aid of soil bacteria (Rhizobium sp). 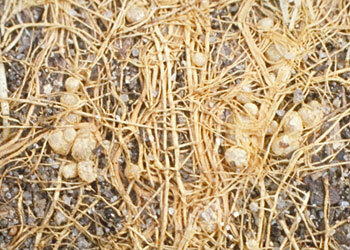 This occurs in nodules on the roots of the plants, as shown in the photograph at right. Australian acacias are generally small to large shrubs but there are a few which become large trees. The individual flowers are very small but are arranged into rod-like or globular heads of a large number of flowers. The colour is almost invariably in the range between white and bright yellow but one solitary species (A.purpureapetala) has mauve flowers and a recently discovered form of the normally yellow-flowered Acacia leprosa has deep pink flowers. This form has been given the cultivar name "Scarlet Blaze"
Many Australians regard the flowering of wattles as signalling the coming of spring and it's true that many commonly grown species flower in late winter. However, it's equally true that a wattle can be found in flower somewhere at any time of the year. Following flowering, seeds develop in pods (legumes) which vary in shape between species and may be flat, short, elongated or cylindrical. In the majority of species, the compound (bipinnate) leaves which appear on all Acacia seedlings are quickly replaced by flattened stalks known as phyllodes, as shown in the diagram. Phyllodes have a leaf-like appearance and can be enormously variable in size and shape. A few species, such as the well-known "Cootamundra wattle" (A.baileyana) and "Mudgee wattle" (A.spectabilis), retain the compound, fern-like leaves throughout their lives. Many Acacia species occur in areas where bushfires are common, such as dry forests and woodlands. In these habitats they are often "pioneer" species, quickly recolonizing burnt-out areas and then being gradually replaced by other species in the plant community. They are often helped in this role by ants which store the seeds underground. The seeds themselves usually have a very long viability. Sub-family Caesalpinioideae (Senna, Cassia and relatives). This latter classification now seems to have been adopted by Australian herbaria and is also used on these ANPSA pages. The previous classification into three separate families will still be seen in books and in other websites. The following table summarises the 'previous' and 'current' classifications. The sub-family name Mimosoideae takes its name from the Mimosa genus. A long running debate about the classification of Acacia was resolved at the 2011 Botanical Conference held in Melbourne. Those supporting the retention of Acacia for the African group argued that the genus was originally described from an African species, A. scorpioides (syn. A. nilotica). Those supporting the retention of Acacia for the Australian group argued that the vast majority of species occurred in Australia and that reclassification of those species would incur considerable disruption and expense. Proposed Name Changes in Acacia. Acacia Name Issue (from the World Wide Wattle website). One consequence of the adoption of the first view would have been that most Australian acacias would have been reclassified into a new genus, Racosperma. However, the decision of the 2005 Botanical Conference, and confirmed at the 2011 Conference, was that the name Acacia should be retained for the Australian species and that the (mainly) African species should be reclassified into the genus Vachellia. This involved specifying a new type species for Acacia, A. penninervis. The impact of the 2011 Botanical Congress decision on Australian acacias is that nine species have been reclassified as Vachellia and two have been reclassified as Senegalia. All of the remainder (over 950 species) remain in Acacia. Several Acacia species provide commercial returns both in Australia and overseas. The bark of A.mearnsii (one of the "Black Wattle" group) is valuable in the tanning industries and commercial plantations exist in a number of countries (eg.South Africa, Brazil). Unusually, Australia actually imports much of its need for A.mearnsii bark tannin from South Africa where the tree has unfortunately escaped from plantations to become a pest species. The quick-growing characteristics of many of the larger species makes them useful for soil erosion control and for providing fuel for cooking and heating. Australian aborigines traditionally used the seeds and roots of a number of Acacia species as a food source but it is only fairly recently that research has started to be undertaken by a number of organisations to determine the nutritional potential of several species as well as any potential toxic effects. Some limited use of Acacia as a food is occurring in the "bush food" industry with, for example, ground Acacia seeds being used as a component of a bread known as "Wattle Damper" and as a flavouring for ice cream.